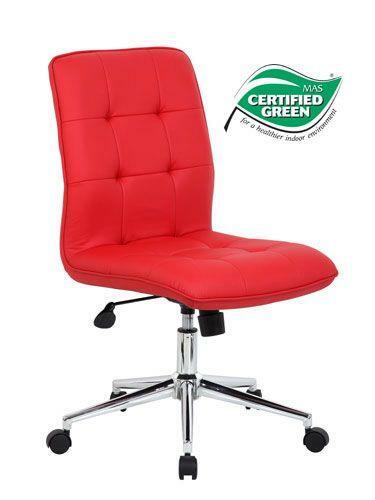 Sophisticated, without being overly formal, this task chair has the comfort and style you need for your office space. A chrome base gives the piece a sleek look, while line tufting adds refined style. The red leather-like upholstery provides a pop of color in any space. The Modern Task Chair by Presidential Seating at HomeWorld Furniture in the Hawaii, Oahu, Hilo, Kona, Maui area. Product availability may vary. Contact us for the most current availability on this product. Browse other items in the Modern collection from HomeWorld Furniture in the Hawaii, Oahu, Hilo, Kona, Maui area.